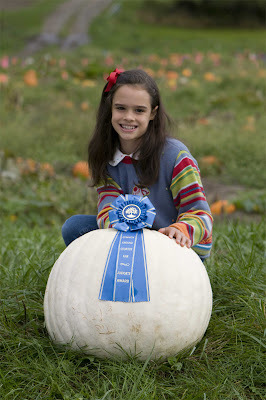 Sienna Mazone, age 9, of Dresden, Maine, won first prize in the Great Pumpkin competition at the Common Ground Country Fair in Unity, Maine. Her entry was Polar Bear, a Johnny's Selected Seeds exclusive variety, that weighed in at 65 lb. See story in Morning Sentinel (Waterville, Maine) daily newspaper. Sienna, who is home-schooled, helps with the family vegetable garden as part of her science curriculum. Her spring semester science project was to grow a Polar Bear pumpkin, a striking, white-skinned, Johnny’s-bred variety. Sienna said she started the Polar Bear seed at the end of April in the family's greenhouse and transplanted it to the garden at the beginning of June. She fertilized with organic goat manure and put down Johnny's 's BioTelo black mulch to suppress weeds and warm the soil. As the plant grew and developed fruit, Sienna pulled all but one pumpkin off the vines to help concentrate the growth to the one remaining fruit. It worked as the pumpkin grew to 65 lbs. It looked so nice, that the Mazones decided to enter it in the pumpkin growing contest at the Common Ground Country Fair Exhibition Hall. There, it won first prize and the Judges award. Johnny’s hosted a nearby vendor booth and product demonstration area at the fair. Some employees noticed the pumpkin on display and were so impressed with its size, beautiful white skin, and uniformity, they asked if Johnny's could show off Siena’s prize-winning pumpkin at agricultural trade shows this winter. Sienna has given the pumpkin to Johnny’s in exchange for photos of the pumpkin and a tour of the Johnny’s Trial Farm in Albion. She will also receive a box of some 40 varieties of seeds for her garden next summer, including, of course, more Polar Bear Pumpkin seeds! Look for the pumpkin as it tours northern New England this fall and winter with Johnny's Commercial Sales Rep. Christina Hillier. There she is! A sweet student I've enjoyed working with this past summer! Congratulations, Sienna! It is so great that students participate in such contests. It ia important to have social life besides the studying. Because if you get to involved with all the essaya and papers you will just fall out of normal life. I often use papersbattle.com that helps me with my dissertations and essays. That is a real life saver. Students must be involved in every another event besides study, as well as they should read the argumentative essay on gender inequality in order to be more understanding and tolerant each other, because when they become such, they grow up like that seed into wonderful adults.